Cant wait to see Survival added to the game, but so far I'm in love. Keep up the good work! I'm gonna buy it here soon but I can't wait for the onboard wep systems to be functional along with multiplayer. I will fly my fighter with show wepons proudly until such a date. Doesn't lag for me, only whenever I ram my ships into asteroids. If it doesn't lag you haven't built a lot in your world. I have an AMD 6 core 3.9 GHz with 10 gig ram and a FTC 650 and it gets really leggy flying my giant star destroyer around. Even with limited gameplay at this moment, I find my self succed into this for hours and hours. This is something I wanted since I first time played minecraft! Kudos for Space Engineers! May it live long and prosper! Amen! I've been hooked since I downloaded it! I say get multiplayer server software up and running first so people can have fun with friends even with the limited gameplay multiplayer servers would be a very good for the game. many of my friends would buy this right away, even the people that play on my dedicated minecraft server. Nah, i think they should focus on survival first. It will help them nail down the concepts so that they can adjust them for multiplayer later, rather than redo work when a new survival thing is added. Plus, keep in mind that it's in ALPHA. In Alpha, really the only people you want playing the game are people who are craving for this kind of experience. Other people who just want a fun game to screw around with friends won't really have much with the game, and will be bored quickly. Cant wait for multiplayer, myself and another are currently working on Stargate ships that are somewhat.....large and we need to help each other easily! I can't wait for this to go multiplayer, I have 3 or 4 friends who also have it, we having been building seperately while in the same voice chat, and to actually help each other would be amazingly fun I feel. Already spent far longer in the game then is probably healthy, but even with the currently limited gameplay I just can't seem to get enough of it! When you will activate the Small Ship guns? I have created a spaceship for mining and terraforming but i need to wait to upload the "Crater Maker"
Voting systems for games are generally bad, really bad. But yes multiplayer is the one thing that I long for the most. Loving the game very much, unfortunately I can't really enjoy it as like several others, after building a certain amount, or after making objects a little more complex or large than the basic starter ships and stations, the game completely crashes, and corrupt my world, which means I have to start over again. If there's a fix coming to ensure that the game won't crash depending on how big we want to make our creations, it would be hugely appreciated. I feel so limited by the game because of worrying "if I build this, will it crash randomly?" I tried this and it works, to an extent. My small ships didnt share the gravity well the big ship had and went bouncing around in my 'hangar' getting smashed up or just falling out completely as I went on suicidal ramages...er meaningful explorations. Would love to see some space pirates added along with the guns working, but aside from that,i love this game so much! Any idea when MP will be live? Many are waiting for it. I would REALLY like to see more blocks, maybe longer slopes for building really awesome space fighters! I kinda wanna know how the mining system is being planned. With the ores and ingots and such, or even the raw material. I'm most looking forward to a robust single player survival mode with AI opponents. Many of us are not into multiplayer. With full single player action, Space Engineers will be the kind of game I have been hoping for. This game looks amazing, I can't wait until there is multiplayer so I can build with my friends! I hope this game goes far. I've thought long and hard about why Miner Wars was a mixed success and it always struck me that it was because so much work went into creating a realistic mining system and realistic volumetric asteroid system, and then it wasn't even used in core gameplay -- the point of the game was just to fly around stations that had been pre-designed and to blow up ships and collect valuable loot and upgrades from pre-placed cargo boxes. 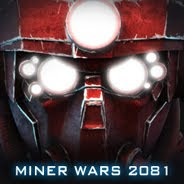 While the game was fun, it wasn't what the game engine was designed for, and it became pretty evident -- and heck, if there were no mining drills at all, and so people thought of it as a shooter instead of a mining game, it would have been better off. Point being, now we have the best of both worlds -- inside the continuity of the Miner Wars universe but prior to the actual Miner Wars, where we're actually doing the mining and building and stuff. It doesn't take a rocket scientist to see the new game's potential. Well, actually, let me take that back: it does take a rocket scientist to see the new game's potential -- but now everyone can be a rocket scientist! Never thought I would enjoy this genre of game. I was dead wrong, I have been consumed since my pre order. I hope to see the Dev's stay on the path they are on. So much potential! Awesome game. Can't wait for actual resource gathering and refining. Combat is personally my lowest priority. If I want to kill things, I have thousands of games to choose from. I really love space engeneers and hope to see the survival update and the weapons unlocked soon. All the best and may the force be with you! not much to do there..but i was stuck in the game for hours just crashing and building ships and then again crashing them :) love this game..cant wait for guns. PS. sorry for english. The thing I want most is working weapons, and to have small ships affected by gravity, so they don't go flying off when I land them in a ship. Will you ever implement planets in the game? The daft community seems to be determined to decide it for you either way. Screaming for realistic-sized planets with water, trees, air and alien animals. Please put this topic to rest before it gets further out of hand. Co-Op! Let me build stuff and blow stuff up with my buddies! Not horde mode, sandbox Co-Op please! With the ability to import base ships or even a empty shell. Love of god, Co-op! just love these kind off games.. howewer i whis u can add docking clamps so the small ships stays inside my massive hangars on large space ships. I am loving Space Engineers. There are five things I really wish existed in the game. 1. A control system for large ships that permits looking out of windows, not just seeing the ship from behind. I want to get the 'inside the ship' feeling just as is possible with very small ships. 2. Doors that actually open and close. The doors not working kind of breaks things for me. They are always open. I presume that is for the future, but... doors are important. 3. I really, really wish that the keys were more context sensitive. So many of the different interaction keys really just could be one single key that works in context with the situation. Fewer keys makes for more pleasant play for us non-programmer types. I honestly think that the entirety of the game could function with six direction keys and two action/interaction keys and the mouse. Just that. 4. Interior decoration and crew items. Sleeping tubes or bunks, tables and chairs, more lighting options, colorful control surfaces or screens - or pictures or anything to suggest that people actually live in the bases and ships. A kitchen or replicator! 5. Real glass windows instead of the shutters. So many awesome ships need proper windows, you know? This game is really fun ^.^ The first thing I did (after flying around the pre-made ships a bit and crashing them) was spend 3 hours building a really simple, really small ship. It wasn't impressive at all, but it made me feel really happy to look at it after it was done. Thank you for the experience [and the ones to come]! Nice job guys, what we really want most is multiplayer. After that, getting tools and weapons working. For starters, a tool to break, a tool to place, and a tool to weld. Could you make a way to get rid of the hints that are not for a block you are looking at? Maybe two different options, block hints and control hints. Something you also need to do make the slots be controlled by the mouse wheel as well and make zooming (hold shift) + roll mouse wheel, or make an option for it. I feel like this will honestly be a game I'll stick with. I hope this game goes mainstream, just imagine servers filled with hundreds of people, building up alliances, having huge battles over resources... I'm getting the chills thinking about it. You guys are on the right track. Keep it up! One bit of advice. Never let the community minority push you to add a bunch of needless features and ultra-realistic physics. I'd still play the hell out of this for a long time just by adding multiplayer, weapons, and sound effects to what you currently have. It does not need planets or quests or abilities and skill levels. Nor does it need tons of furniture and accessories for some imaginary crew. A fairly simple survival mode sounds great. Minecraft and Kerbal Space Program keep adding a bunch of new stuff, but after a while it just seemed like a lot of unnecessary features or realism were added. In KSP's case, you either had to start doing a bunch of calculations or rely on community-made mods just to easily fly to another planet. I just want to go to Mars, dammit. Although, I do have to say, it would be awesome/hilarious to see pressurization. The thought of seeing a bunch of hapless miners being sucked out into space in the middle of battle is pretty cool....but don't do it just because I said so! But If furnitures and other stuff will be add, you can use it or not - your choice. For a hundreds of people it will be amazing and for another not. But simply anobody can use it or not. Adding this stuff is good idea and nobody hurt coz of this. It is killing me to see all the game play of this great game. Unfortunately I can't play it because I have a mac so if there is any way that you could also make this game playable on a mac so that me and all the other people who only own macs could play that would be AMAZING!! Thank you if you do decide to make it available for mac.